270 pages | 20 Color Illus. | 89 B/W Illus. 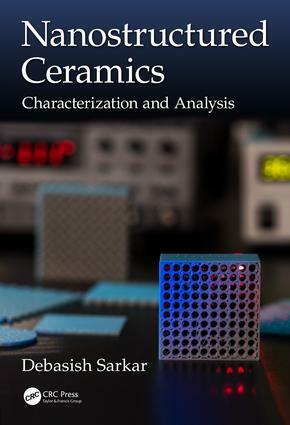 This book discusses fundamentals of nanostructured ceramics involving functional, structural and high temperature materials. It provides both solved numerical problems and unsolved problems to enable the reader to envisage the correlation between synthesis process and properties in the perspective of new material development. It serves as a concise text to answer the basics and achieve research goals for academia and industry. Dr. Debasish Sarkar is currently a Professor at the Department of Ceramic Engineering, National Institute of Technology (NIT), Rourkela, Odisha, India. In due course of visiting researcher in Korea Research Institute of Standards and Science (KRISS), South Korea, he has gained extensive experience in synthesis, characterizations and fabrication protocols of nanostructured ceramics. As Principal Investigator, he has managed several research projects including Nanomaterials for functional and structural applications, and Refractories. The government of India and Industry like Tata Steel Ltd., Tata Krosaki Refractories Ltd, etc. sponsored most of the fund. Debasish is internationally recognized expert in the academic, industrial and translational research in ceramics. Several works are highlighted in "Global Medical Discovery, Canada" as well as published as European patent. He has been awarded Materials Research Society (MRSI) of India Medal Award, 2016 for the work on patient-specific Orthopaedic implants, is a symbol of his outstanding career. He has cumulative 22 years of experience and published 55 peer-reviewed international journal papers, 15 papers in conference proceedings, and 2 book chapters in Pan Stanford Publisher, Singapore and Wiley - VCH Verlag GmbH. He has been a lead inventor in one Korean patent, one European patent and one Indian Patent, and co-inventor for two Korean patents. He has published and reviewed in ACS, Blackwell Publishing Inc, Electrochemical Society, Elsevier, RSC, Springer, etc. He is holding position a member of different Editorial Board and Technical Committee around the globe.